Discussion in '9/11' started by Mick West, Aug 29, 2017. When United Flight 175 hit World Trade Center Tower 2 on 9/11 some large parts of it passed through the building and landed in the streets to the north. One of these was a badly damaged core part of an engine. This landed at the intersection of Murray st and Church St. This engine has long been part of 9/11 "Truther" mythology, with claims that it was impossible that it was used in the 767 (registration N612UA) that took off as Flight 175. This led to claims that the plane that hit the building was a modified drone, or even that there was no plane at all, and the engine was planted there, or in more extreme variants shot out of a cannon from inside the building. Since it has been so long I presumed this has been already addressed numerous times. But when I went to look it up I found a lot of dead links, broken images, and very long threads. I think it would be useful to gather together a concise summary of the facts behind this supposed "smoking gun". First because it's going to keep coming up, but secondly it's such a long accepted part of the mythology. Hence clearly demonstrating that it is in fact the correct engine might give the more open-minded Truther some pause for thought. The Truther objection seem to hinge around the ring of rounded 90° tubes on a ring shaped cooling duct assembly visible at the top of the engine as it sits on Murray St.
And this, which looks like what we actually see. 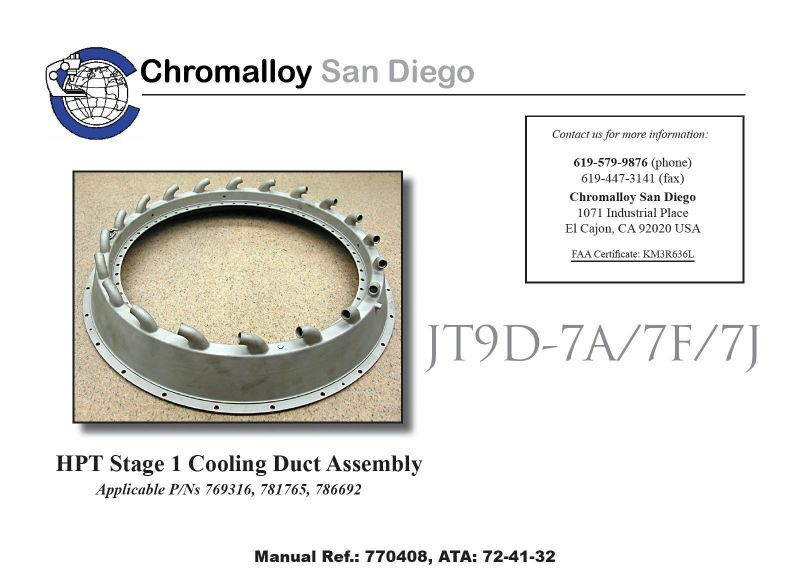 So the claim is that the 767 engine was a JT9D-7R4D, but the part was for a JT9D-7A. 1) How do we know what engine was in N612UA? 2) Is there a bent-tube part like that in the engine that was in N612UA? The type of engine question seems to end up with a broken unarchived link on an IP address that no-longer hosts anything. But the info must exist somewhere. The sense I got from that thread was that many people thought that the two parts were not interchangeable - one was a duct, the other was a duct assembly, so perhaps one was attached to the other. But I did not get a clear answer. It is however hard to see how they could be functionally interchangeable. The point of the cooling duct is to blow cooler air on the turbine blades, the part without the tubes looks like something to transport the air around the outside - i.e. a part that would come before the bent tube part. So basically I'd like to gather the actual facts here, and edit this post into a useful explanation of those facts. I realize this is old stuff, but it keeps coming up, and if I have a hard time finding the info, then most people will. So I invite more seasoned 9/11 investigators and people familiar with aircraft engines (@Oystein, @Keith Beachy, @benthamitemetric, @Cube Radio, @Jeffrey Orling, @jaydeehess, @Redwood, @MikeC, etc, ) to help out in creating this concise explanation. Hopefully it's already been done somewhere - but if not then I think it would be very useful to gather it here for future generations of 9/11 investigators. The TOBI duct, which provides cooling air to the High Pressure Turbine disk, pokes out amidst a sea of clear plastic wrap, as it encircles the engine center shaft area. We keep the plastic wrap over the outer part of the engine, to keep from dropping things down into the combustion can, through the NGV assemblies, which ring the outside of the area. Pratt JT9D-7R4D aircraft engine buildup. 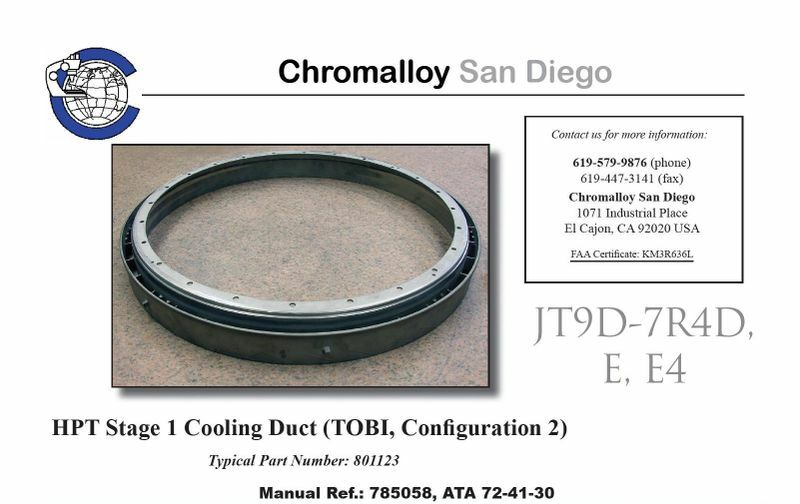 Well that was quick I think the above image pretty much proves that even if the 767 had a JT9D-7R4D then the TOBI duct looks like this . I await objections. Sorry, aircraft specs and details has never been my thing, beyond the most basic (outer dimensions, velocities). Beachy is the aircraft guy here. I found the above image by googling, but I was also independently posted after I requested help on Facebook, along with this image of the same type of engine from the same guy. The duct is not visible here, but you can match this to other photos of the Murray Street engine. More from Fred Robles. This one is great for showing the relative size of the engine part to the whole engine. Doing a final area inspection of the aft end of the Diffuser case/Combustion module, before installing the HPT over top of it. Can't have any foreign crap floating around in there. And a close up from here. The PW4062 is a newer version of the same type of engine. Might just have been an assumption in this initial report. Not a huge complication, as the original claim is debunked. But it might be useful to get a definitive answer as to what type of engine was used. The FAA lists it as "P & W 52054"
Engine part scale comparison. You can see it's a relatively small part of a larger engine. Drag the slider. I can't be of any help here. I have no practical knowledge of jet engines, and I try to keep from commenting on issues beyond my competence. The Boeing 757/767 Flight Crew Training Manual lists one engine type in the landing angle diagrams for the 767-200, the JT9D-7RD4. The 767-300 has this listed plus the RB211-524, PW4000 and CF6-80C2. The 767-400 only lists the CF6-80C2. This initially seems strong evidence that the 767-200 only used JT9D-7RD4. If other engines were possible then they would need an entry on the 767-200 chart, like they do on the 767-200 chart. I changed your text a bit.. if my changes are wrong you can delete this post. If other engines were possible then they would need an entry on the 767-200 chart, like they do on the 767-300 chart. maybe because the only 200 that uses it is the ER, where it looks like all 300s can use it.. ? 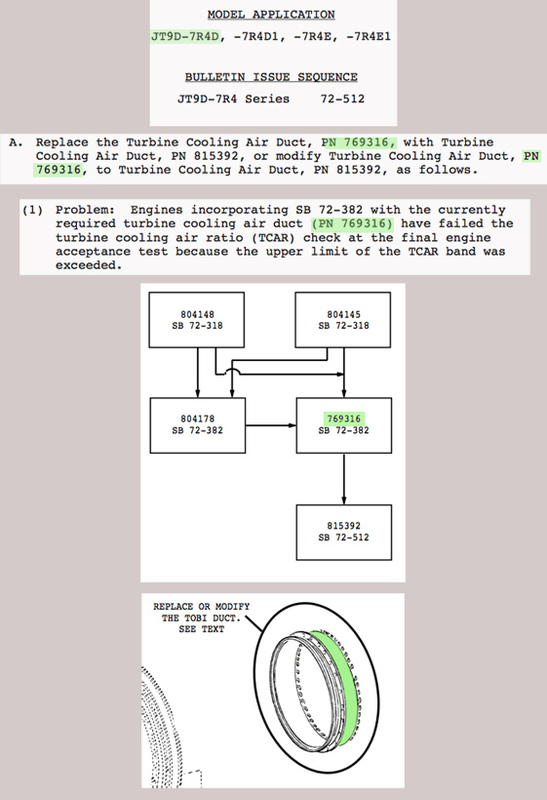 I have these screen shots from Service Bulletin SB 72-512 that describe how to modify PN 769316 on the JT9D-7R4D engine. In short the engine was exceeding temp limit, so they drilled four !/4" holes in the face of PN 76316 and then it become PN 815392. Unfortunately the link I had to this service bulletin is now dead and the pdf I downloaded died with my last computer. Mick. since I actually flew a B-757 AND B-767? OUR B-757 had the Rolls Royce engines....Our B-767 had the GE engine. I just received in the mail a copy of Above Hallowed Ground: A Photographic Record of September 11, 2001, which was published by the Photographers of the New York City Police Department in 2002. Though perhaps not quite so composed as Joel Meyerowitz's indispensable tome Aftermath, the collection of photos in this book is incredible and this should be a ready reference for anyone with a deep interest in understanding the events of September 11 and the recovery at Ground Zero.